The healthcare companies of today are looking at ways to reduce costs and improve patient care. As part of this, Telemedicine is emerging as the new concept of e-healthcare. The new telemedicine platforms are making the healthcare industry more flexible. It is with equipping the patients with the required tools to communicate with the healthcare providers from the comfort of their home. Read on, as we cover the essentials of telemedicine from this blog, including the need and advantages for developing an app, functionalities of telemedicine apps, and the challenges faced by development teams along with incurred costs. Long queues, extended waiting time for a medical appointment or limited access to specialists are issues that led to the modernization of the health care system. Towards this, telemedicine solutions aim to improve the patient’s health by cost-effectively facilitating access to specialists with the use of video and audio mediums. They even allow constant monitoring of the patient’s health condition and performing preventive and control examinations outside the medical facility. Further, remote patient monitoring tools enable healthcare providers to monitor patients across longer distances. Moreover, the electronic health records system eases the information flow. According to a Sage Growth Partners (SGP) survey, there are approximately 66% of organizations with telemedicine systems, which have an annual telehealth budget of $250,000, or less. They surely highlight the potential of growth as healthcare organizations realize the benefits of telehealth systems. It is across creation of newer telemedicine platforms, like virtual care, digital records system, remote patient monitoring tools by enabling IoT, AR, and VR. The advancement in telemedicine continues to create the need for mobile healthcare applications that are no longer an optional investment but a necessity. Therefore, several large healthcare companies are embracing telemedicine software development in its entirety. According to the American Medical Association and Wellness Council of America, almost 75% of the ER, doctor or urgent care visits did not require any physical examination. Also, they could be managed via audio call, or video conferencing. Thus, the use of telemedicine applications for healthcare is a step to segregate communication between doctors and patients outside the traditional setup. 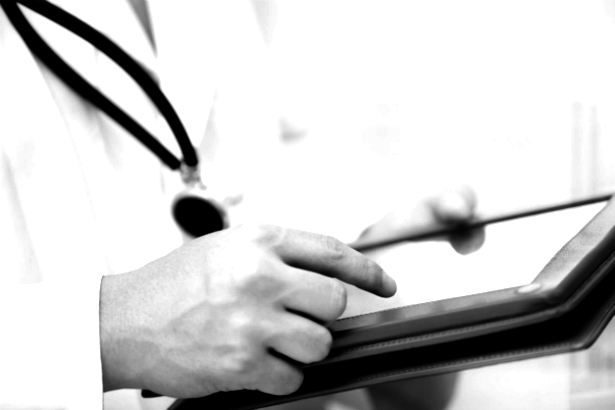 Learn more about the benefits offered by healthcare apps. Also, how they help deliver quality care services with enhanced workflow and increased patient interaction. It is ideal for specialists like dermatologists who can diagnose the condition based on visible symptoms. The app requires the patient to answer a few questions and share a picture of the affected area. Based on this input, the doctor can diagnose and share the course of treatment. The laboratory test results can be shared through the app for further analysis if needed. It is easy to connect with a doctor through a telemedicine app when the patient is aware of the diagnosis or symptoms and wants to seek a professional opinion. The patient can book an appointment after answering a few basic questions. Further, they can even select the doctor and schedule a video call. The application does allow the patients to consult the medical practitioner in case of questions regarding dosage or any unwanted side effects, or any other observations. It enables them to share or type their prescriptions and connect with the doctor through chat or video call. It is one of the best benefits of telemedicine apps for patients. Patients tend to delay prescription renewals when they have to make an in-person visit to the doctor’s clinic. The app, however, allows patients to schedule an e-visit on the day they run out of medication that is available through the software. Further, modifications or changes in medicine can be arranged through telemedicine applications. Besides, even the e-version of instruction is valid at the pharmacy. 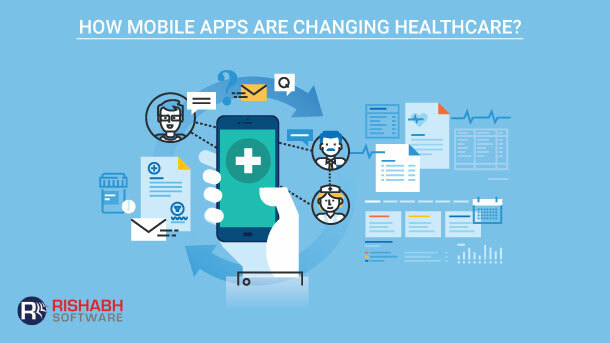 Further, the healthcare organization will have to develop two different apps to address the doctor and patient’s requirements for Android and iOS by considering the diverse target audience. Therefore, to conclude, healthcare companies need to start investing in telemedicine app development if they want to keep their end customers to be satisfied in the years to come. With more and more companies, investing in the telemedicine platforms, the patients can expect to benefit from the new generation digital services. 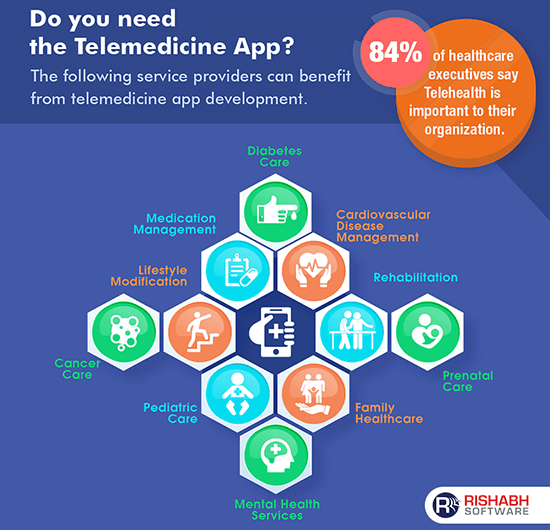 Therefore, the organizations can stay ahead of the competition by identifying a suitable telemedicine solution provider, like Rishabh Software who understands the specific requirements of the healthcare industry. We are on top of the latest trends of innovations in the healthcare technology vertical.